Once upon a time our Founder, Alex Fair didn’t know anyone in healthcare but he had a great idea for a startup and he needed help to refine, build, and drive adoption for his idea. He had been a healthcare CIO in the 90s but by 2009 after eight years out of the sector, he knew few people who could help with is vision. 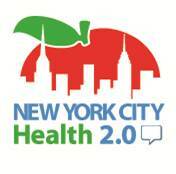 So on April 2nd, 2009, he attended a meetup called the New York Health Technology Organization started by Eugene Borukovich, the same group that later became the first local chapter of the Health 2.0 conference company and the template for over 110 others around the world. That day Alex met folks like Murray Jones and Lynn Nezin and it really helped in the startup he was working on at the time. The next Summer Eugene took a job in Europe and asked Lynn and Alex to run events for the summer. That first event they ran was called “Healthcare and Social Media, Connubial Bliss or Collision Course” and it was a smashing success, doubling the size of the group in just a month and quickly growing. Alex also started teaching his methods to other groups around the world, helping grow a global network of Health 2.0 meetup groups. That group grew into MedStartr and now we create and produce healthcare innovation focused conferences, contests, and events around the US with over 85 run in nine cities around the US, but still mostly in NYC. Our events, platforms, and contests are intended to help healthcare innovation stakeholders connect with those who are developing the hottest new products and services to improve healthcare. Since our first event we have seen thousands of new teams formed, investments made, partnerships and pilots begun, new adoptions, mentorships, internships, and press stories that started at our events or at our website – or both. 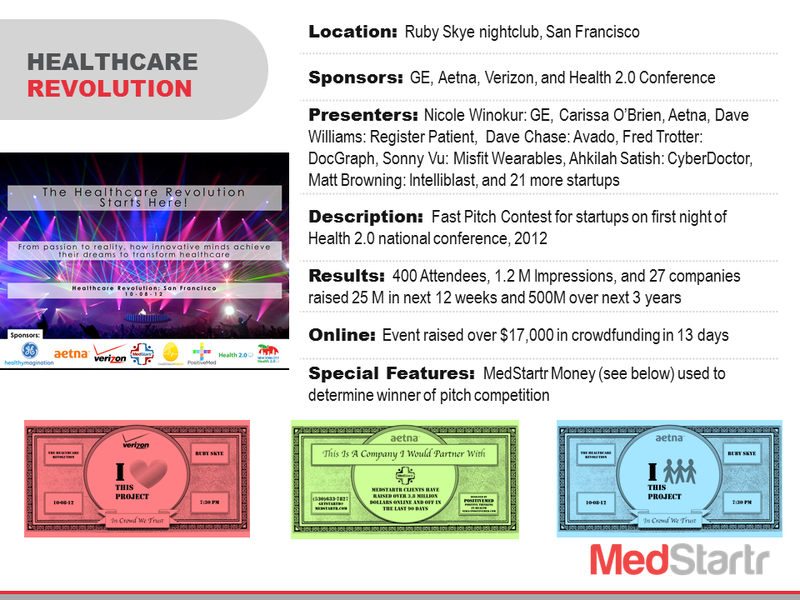 MedStartr.com, our leading healthcare innovation crowdfunding platform was also born during an event called the #Healthcare #Gameification #Flashmob and then launched at an event called “Healthcare Kickstarter” a month later. Last, but not least, our Crowd Challenges always end with a live pitch contest, bringing the online off an back again with the livecast. 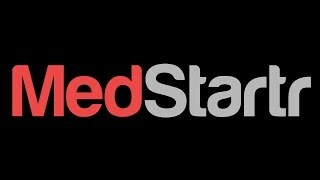 We almost always livestream them and post them on MedStartr.tv, so you can watch them there anytime. While videos and great write ups are the core of what ma ke crowdfunding work, in person support is important too – especially when considering pilots, partnerships, mentoring, hiring, and investing in healthcare ideas. You really want to get to know someone before you decide to support their clinical trial or invest 100,000. We run pitch contests, shark tanks, crowd challenges, speed dating events, hackathons, and more – all with the goal of driving engagement between healthcare stakeholders and startups. We think of events as our secret sauce and are probably why MedStartr works up to ten times better than any other site for healthcare innovation crowdfunding. We crowdfunded this fantastic event with over 400 attendees at Ruby Skye in downtown San Francisco. With 27 companies on stage that night including the debut of the Misfit Shine and Fred Trotter’s DocGraph, this was an epic evening. Dr. Nima Skeiksolemi of PositiveMed also designed “MedStartr Money” which was used for a live crowdfunding contest where teams like care.coach collected as much MedStartr Money as possible to win the support of the crowd. 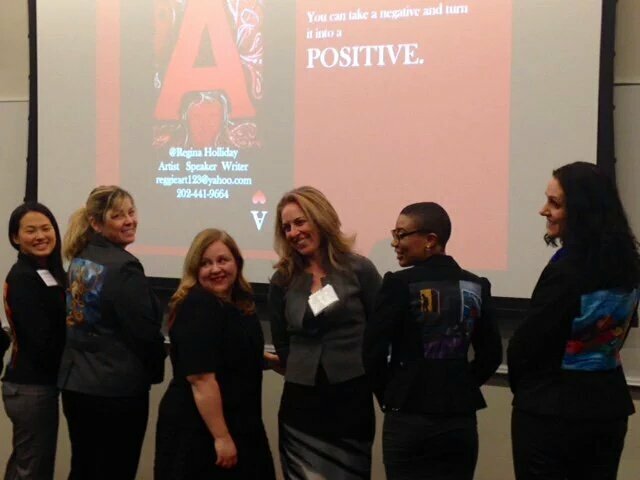 Left to right: Dr. Wen Dombrowski, Mary Camp, Regina Holliday, Susannah Fox, Tiffany Peterson, Amy Cueva, and the Walking Gallery made MedMo15 great! Our first full day conference in New York with over 40 speakers and 16 companies on stage at Microsoft’s headquarters. This event brought together over 200 leaders for the day including then CTO at HHS, Susannah Fox and many More. See the full conference program here. 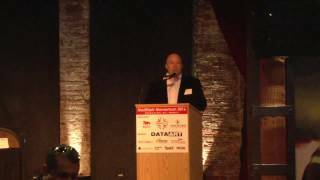 In 2013 we began running events within events and helping other organizations run pitch contests within larger events such at HealthDataPalooza, the Health 2.0 National Conference, and the Annual conference of the American Medical Association. 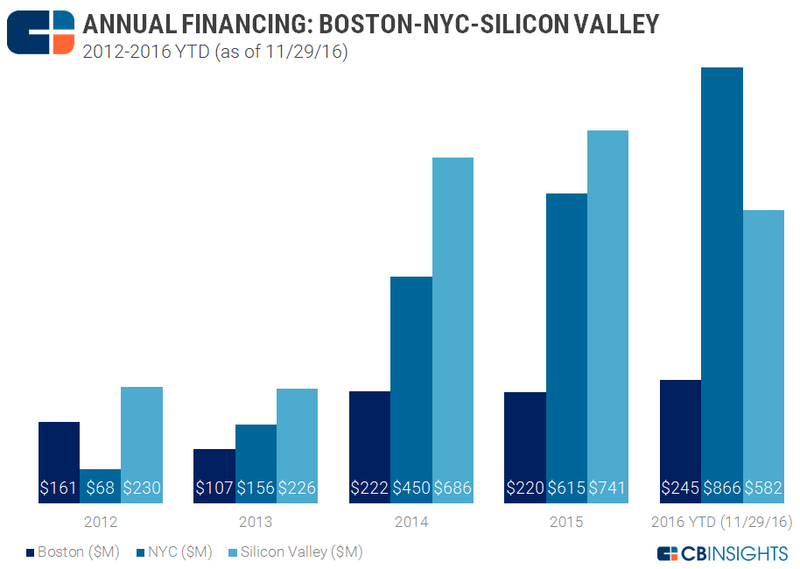 We have run over 70 events in NYC since 2009 a nd in that same time period New York has become the #1 city in the US for healthcare innovation and investment, going from less than 20% of the funding of Silicon Valley to 49% more than Silicon Valley in 2016. What can we do for your community? We have provided design assistance for numerous governments and agencies around the world and made NYC into the world leader in healthcare innovation and investment in just a few short years according to CBinsights. What can we do for you? We have assisted others to Crowdfund Events and fund travel scholarships and more as we did for our friend, Regina Holliday in her first Partnership with Patients conference, called #Cinderblocks. We have helped bring more patients to the stage for the Doctors 2.0 conference as well as several others too. We also organize events and tweetups, and crowdfunding contests at Health 2.0, HIMSS, Health Datapalooza and conferences like the American Heart Association’s Innovation and Investment forum and the AMA annual conference. We would love to discuss how we can help your company, organization, city, or nation driving healthcare innovation faster than ever. To learn more, please email us at Events@MedStartr.com or call 530.MED.STAR today! To see the full events video gallery please click here. To Join our NYC meetup Group, please click here. To get help setting up a healthcare innovation community in your city, click here.